Qazi Abdul Alim has received many awards for his remarkable achievements. As a top athlete of Dhaka University he received the gold medal by chancellor WA Zenking. He also won the national sports award in 1977 for his contribution to sports, the Qazi Mahbubullah gold medal. For his widespread contribution in sports he got the "Shadhinota Padak" in 1993. Even in his old age the ever youthful Alim still has a lot to contribute in the field of sports. In terms of developing a sports culture in this country, people like Alim are invaluable. Recognising him for his achievements and honouring his vision is our duty. 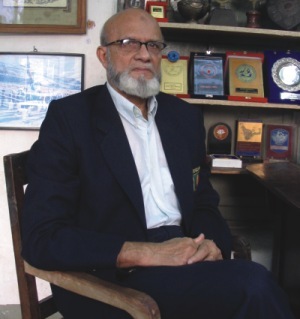 Whether he gets what is due to him or not, there is no denying the fact that Qazi Abdul Alim will always be a distinguished figure for his outstanding performance and contribution to sports.